Flying high in Pakka Adventure Park, Kalajoki: took the Mega Zipline, the longest zipline in Finland (4th July 2016). Jumped out from the top of the X-Tower (32 metre tall), and got a magnificient overview over the Kalajoki Sand Dunes for an incredible 330 metre stretch! The X-Tower is Europe’s largest adventure Tower, and on the side of the tower runs an incredible 21-metre-long climbing wall. 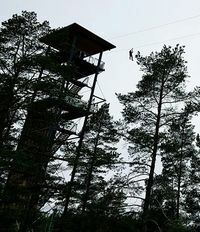 The Pakka Adventure Park in Kalajoki is for thrill seeking adventurers: here we move around on hanging bridges, rope trails, trees for climbing and ziplines. Great slides, free falls and climbing walls.